I’ve been using a small, store-bought purse for my day-to-day needs, but decided that I really need to make my own. I fell in love with the new Elementary fabric collection by Sweetwater and recently picked up a charm pack and some coordinating half-yard pieces. I love how the colors look together in this collection and the back-to-school theme is perfect for fall. 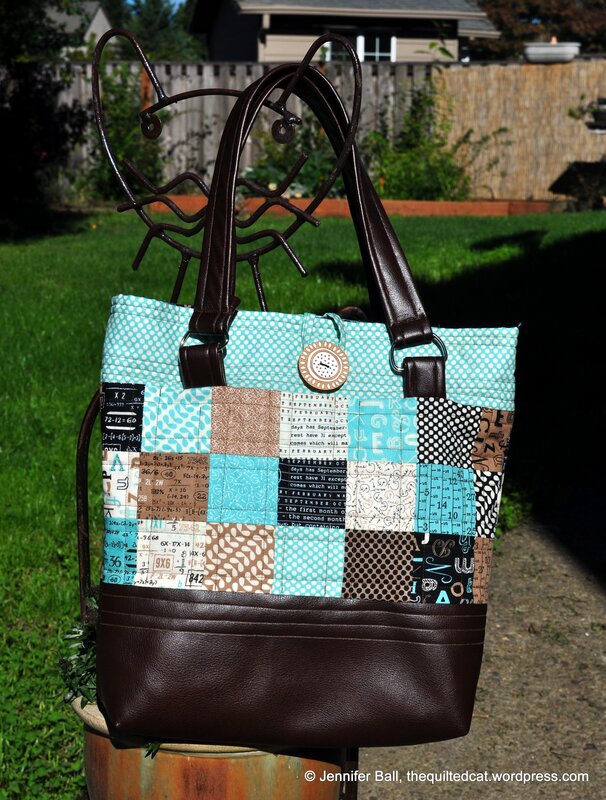 I used a bag pattern called the Oak Park Bag by Loft Creations. For the base, I wanted a heavier material than cotton, but still something that would look nice with the Sweetwater fabric. I picked up a gorgeous piece of espresso-colored faux leather. I think the leather really adds some character and style to the finished bag! I used Aurifil 50 wt in brown (#2372) for the piecing and straight-line quilting. The lining is fusible fleece, but I really want to try Annie’s Soft and Stable when I make this bag again. The fleece will work fine, especially once the bag has a few items inside it. 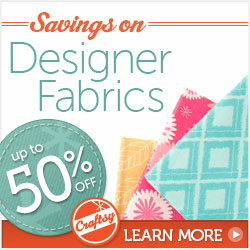 But, I saw the Soft and Stable product at a quilt show recently and now really want to try it out! I did use a leather foot and a leather needle. I stitched really slowly on my Bernina since the leather, especially on the handles, was so thick. I did break 2 needles in the process so I probably will not use the faux leather on the handles again. However, on the base, the faux leather worked fine since it was just 1 layer. 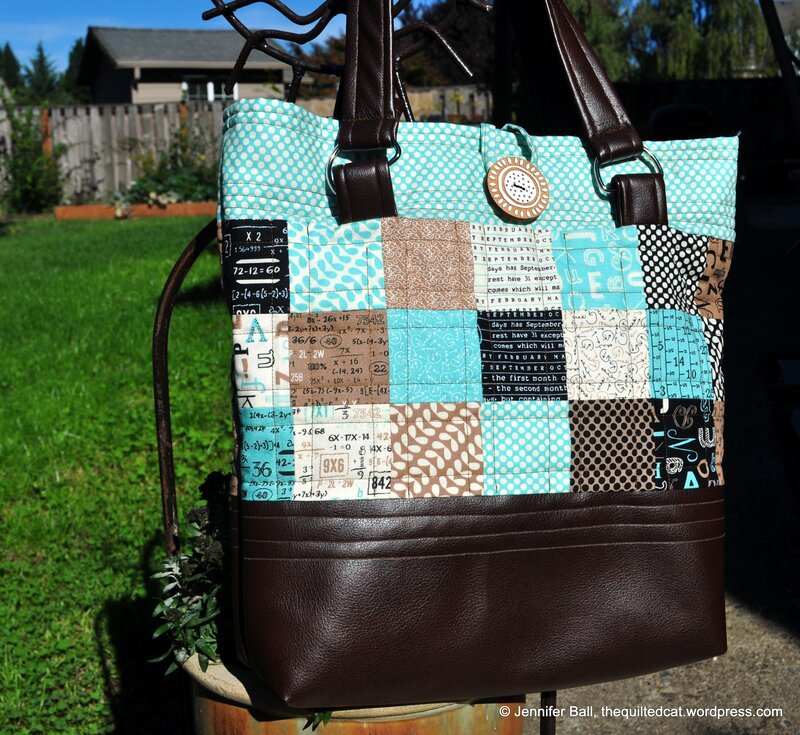 The finished bag measures approximately 13-inches wide by 19-inches high. The inside is lined with the Elementary fabric as well and has 1 pocket. I have only made a few bags so this project really help me improve some skills. I hope to make it again since it came together pretty quickly. In September, I visited the NW Quilting Expo in Portland. I found some gorgeous turtle batik fabric that I just knew I needed to have!!! 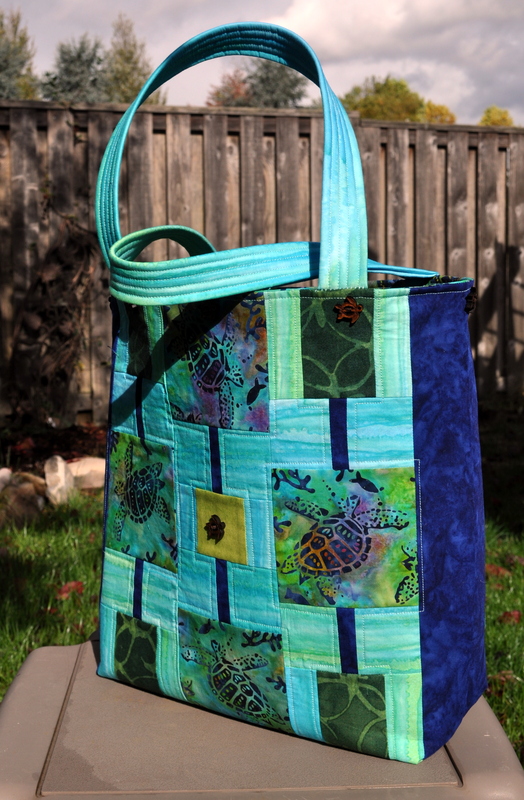 The vendor for the turtle batik is Quilt Passions and you can buy the fabric online. While continuing to browse the expo, I came across another vendor who had a bunch of cute bag patterns that only require 6 fat quarters and some fusible fleece to make. 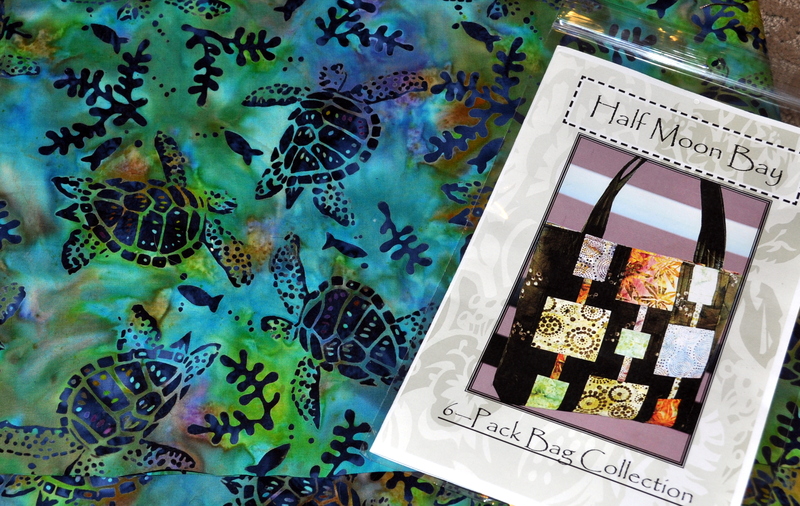 After pondering the bag patterns, I selected the Half Moon Bay one because I thought I could modify it to use my turtle batik fabric. This past week, I had the chance to make the bag. 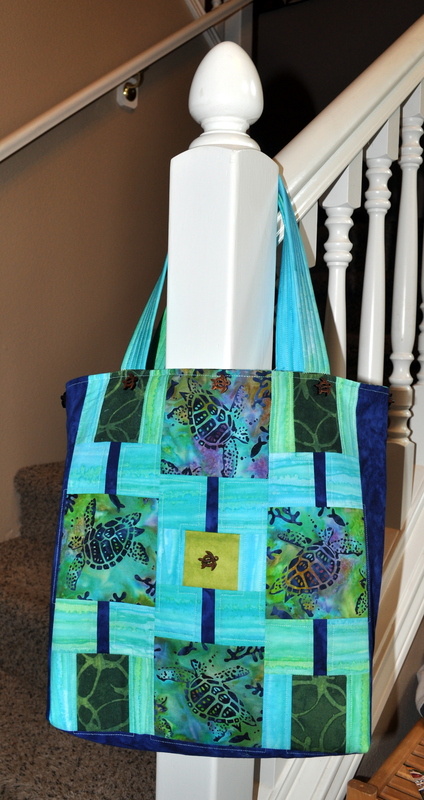 I fussy-cut the larger squares in the pattern to feature a turtle from the batik print. I also used a lovely batik that looked like water for the background and handles. The accent fabrics are a dark blue batik, a dark green print batik with a slight turtle pattern, and a light green batik. 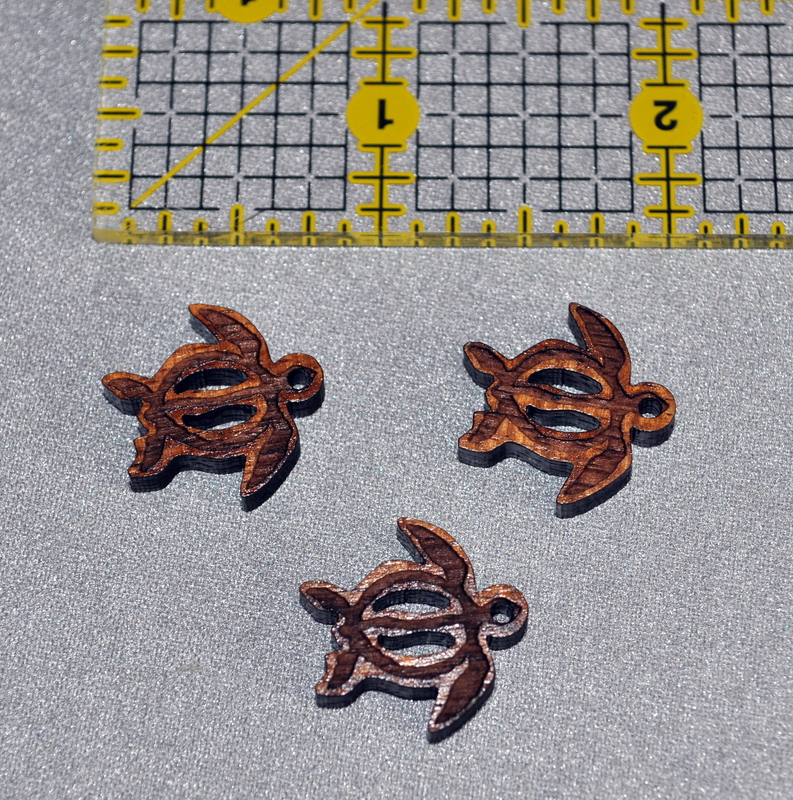 As accent items, I purchased some little honu (turtle) charms cut from koa wood from Etsy. I hand sewed 1 honu charm to each light green batik squre and sewed additional charms along the top portion of the finished bag. Since I did modify the pattern a bit, I used more than 1 fat quarter of the turtle batik fabric to fuzzy cut the squares and to use it for my lining. I used 2 fat quarters of the batik water print, 2 fat quarters of the dark blue batik, and portions of 1 fat quarter each of the dark green batik and light green batik. This little honu bag brings a smile to my face!